If you’ve followed me for any amount of time you probably know I love making baked oatmeal cups, but these Orange Cranberry Baked Oatmeal Singles may just be my favorite ones yet. I am positively swooning over them. It doesn’t hurt that bright, sweet orange with tart cranberry is one of my favorite flavor combinations, especially in baked goods. I honestly don’t know how else to say it besides please make these, if you love them even 1/10 as much as I do then you’ll positively adore them. Plus, as with all my baked oatmeal singles, they come together super quickly and easily (who doesn’t love an easy recipe?) and they make perfect grab-and-go breakfasts for the week. I also think they’d be pretty perfect on Christmas morning with a cup of coffee while opening gifts! 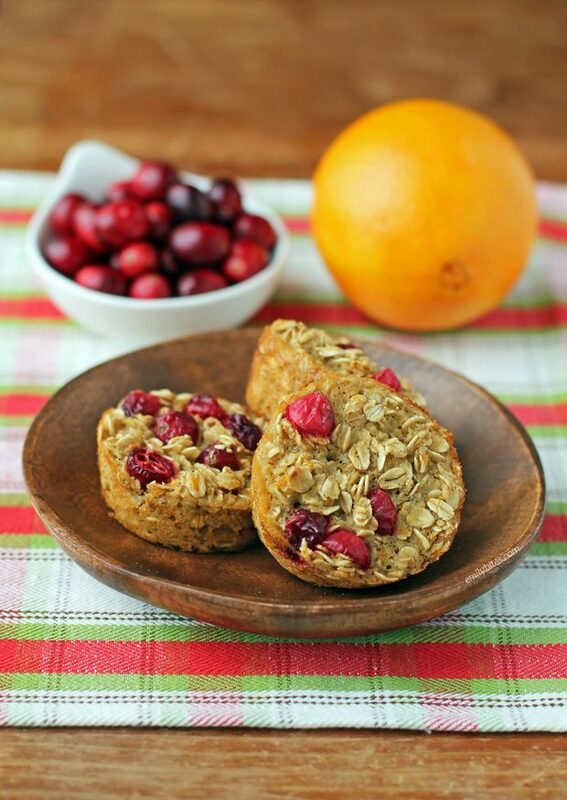 Not only are these Orange Cranberry Baked Oatmeal Singles hearty and delicious, each one is only 94 calories or 3 Weight Watchers SmartPoints. Now that’s a perfect way to start your day. Looking for more baked oatmeal recipes? Try my Pear Gingerbread Baked Oatmeal Singles, Strawberry Banana Baked Oatmeal Singles, Blueberry Baked Oatmeal Singles, Banana Chocolate Chip Baked Oatmeal Singles, Carrot Cake Baked Oatmeal Singles, Apple Cinnamon Baked Oatmeal Singles, Pumpkin Chocolate Baked Oatmeal Singles, Chocolate Cherry Baked Oatmeal Singles, Pumpkin, Cranberry & Apple Baked Oatmeal or Blueberry Peach Baked Oatmeal! In a separate bowl, whisk together the egg white, egg, milk, applesauce, orange juice and orange zest. Add the wet ingredients to the dry ingredients and stir until blended together. Stir in the cranberries. Spoon the oatmeal mixture evenly between the prepared muffin cups. Bake uncovered for 20-22 minutes or until oatmeal is lightly browned and a toothpick inserted into the middle comes out clean. These are amazing. So filling and bursting with flavour. 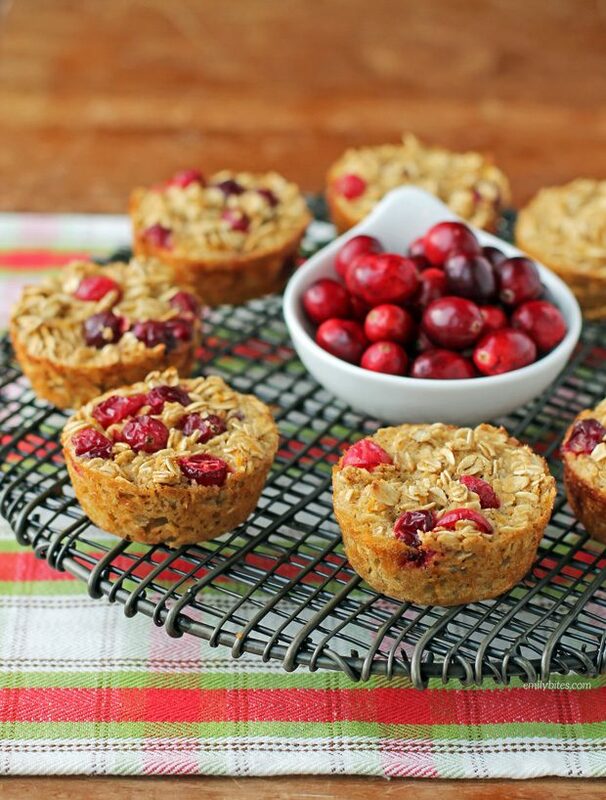 I love fresh cranberries and now realize I need to use them more in baking! Thank you so much for sharing this recipe with us. You rock! These are awesome! I’ve enjoyed all your baked oatmeal recipes and this one is by far my favorite. I did add 1/2 teaspoon of cinnamon and it added a nice flavor. this definitely inspired me to try more with fresh cranberries. These are so good! I love this flavor combo but there are only a few items with it that fit within my my Smartpoints budget. Thank you for all your good recipes- they have really helped keep my weight loss on track. Are these baked in the mini 12 cup pan or the larger 6 cup pan? These are made in a standard size muffin tin, not a mini or a jumbo. My tin has 12 spaces, but there are some that have 6. Hi, these look delicious! Question: can I use steel-cut oats or does it have to be old-fashioned oats? Any idea how much protein these have? Thanks! Hi Becca, the nutrition information is listed at the end of the recipe :). Each single has 3 grams of protein. I got to use the micro plane for zesting for the first time.. They turned out great and are so good!! using the juice from a fresh orange really make these pop! Also.. I could only find dried cranberries..so I only added 1/2 and then dotted the tops with 1-2.. Very very good! this is a keeper. I may add more cranberries next time. Due to the time of the year I was only able to find frozen cranberries, not fresh. I thawed them for about an hour and used them in the recipe. I cooked for the full amount of time and was pretty sure my fork came out clean last night when I checked them when they came out of the oven. I let them cool in the tin for about 5-10 minutes and the bottoms of them were wet when I pulled them out and are still wet this morning. I still gobbled a couple down because the flavor was incredible but I’m wondering if I should have let the cranberries thaw longer or if I should have cooked them longer? Any ideas? I’m obsessed with the flavor and would like to give them another go. I made these today, but couldn’t find any cranberries and replaced them with blueberries. They smell so delicious, and I can’t wait to eat them for breakfast tomorrow. The only question I have is what is the easiest way to get them out of the muffin pan. I sprayed the tin liberally with cooking spray, and some of them did stick. If anyone has any suggestions, I would appreciate it. I am loving all of your recipes. Thanks so much for all of your hardwork. This is one of my favorite go-to breakfasts. I actually doubled the recipe so that I had enough to fill me up for breakfast, and it comes out to five points for me. They’re great either cold, or warmed in the microwave with some milk on top. 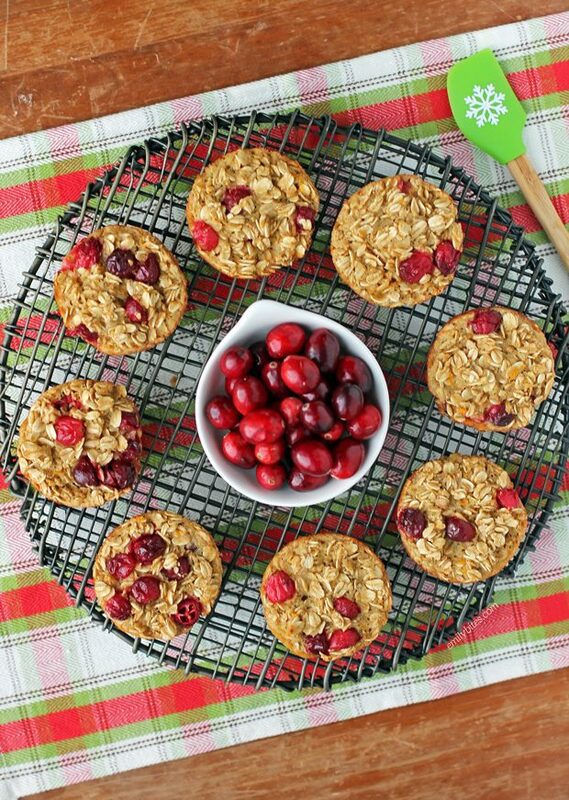 I also use dried cranberries when fresh cranberries aren’t available.Thanks so much for this great recipe! Hi Doris, I only have this recipe calculated the way I wrote it so if you want to play around with quantities or make changes you’ll have to plug the ingredients into the recipe builder on weightwatchers.com. I hope you enjoy them! I had the batter mixed up and was ready to fill the muffin tins when my oven started going nuts – the error code meant something overheated. We had to unplug the stove to let it cool down and reset so I sprayed my waffle iron and made this into waffles! Delicious and made 16 segments, 2SP per segment. Great job thinking on the fly, I will have to try that!